I was wondering if I should bother with a Harvest Monday post today because it's samo samo, who wants to see the same carrots, the same celery, the same... but then I remembered, there was something new last week! Pardon the fuzzy photo, it was getting to be dark when I harvested and photographed, but I just couldn't resist this shot of the somewhat anthropomorphically posed Monarch celeriac (um, not such a royal looking pose though). I guess it could be a royal looking octopus. Anyway, it was delicious prepared rather decadently with a topping of local sheepsmilk ricotta and feta which was enriched with creme fraiche (I was cleaning out the fridge, honestly). First I cubed the celeriac, then sauteed it with some chopped onion. After the mixture softened up I plopped dollops of the ricotta mixture over the top (which also had chopped fresh parsley mixed in), then the whole lot was baked at 350ºF for about 30 minutes. I served it with a salad of mache (store bought) with avocado and grapefruit (all store bought, oh well). Mmm mmm good. Something else somewhat new and the beginning of an end - one of the lacinato kale plants is starting to bolt. Fortunately I caught it before the flower buds got too big or too infested with aphids. This bunch of kale went into a soup featuring Rancho Gordo Hutterite Soup beans and one of my Black Futsu squashes and a ham hock from Fogline Farms. Just what the doctor ordered for my honey who came down with a cold this weekend. 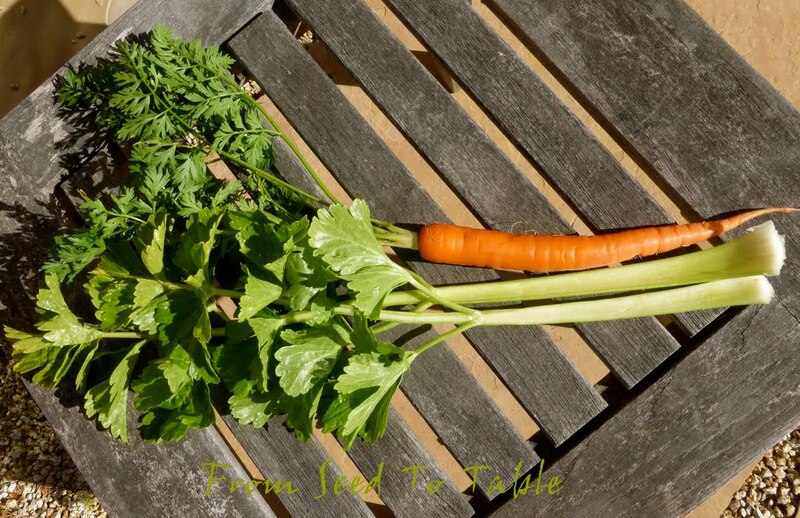 Ah, the same celery (just one of many harvests last week) and the same carrots. Last week I remembered to take advantage of the young tender celery leaves in a Celery Leaf Salsa Verde. My preparation was loosely based on the recipe from The Zuni Cafe cookbook. It was a mixture of chopped celery leaves and small stems, chopped parsley, chopped capers, minced meyer lemon rind, meyer lemon juice, dried Aleppo pepper, minced red onion, minced salt packed anchovies, and lots of olive oil. One aspect of this mixture that was very pleasing to me was how many of the ingredients came from my garden - everything but the onion, anchovies, and olive oil - but all of those were local - even the anchovies came from Monterey Bay which I purchased fresh and salted myself. This salsa is fantastic mounded on top of grilled steak. Oh, I forgot my one new addition - I love walnuts and celery together so I added some chopped walnuts (also local) to the mix. 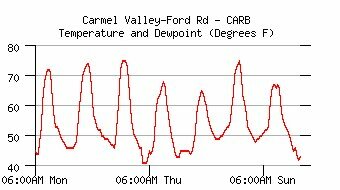 Is there anywhere in the US that is experiencing "normal" weather? At least the thermometer didn't register above 80ºF last week, it even dropped below 70ºF for a few days when the fog flirted with us - cool and moist, but you can't fool me - you're not RAIN. But, guess what, it might rain later this week!!! Keeping my fingers, and toes, and arms, and legs crossed. Circus Circus carrots - 5.2 oz. Dorato di Asti celery - 1 lb., 14.6 oz. 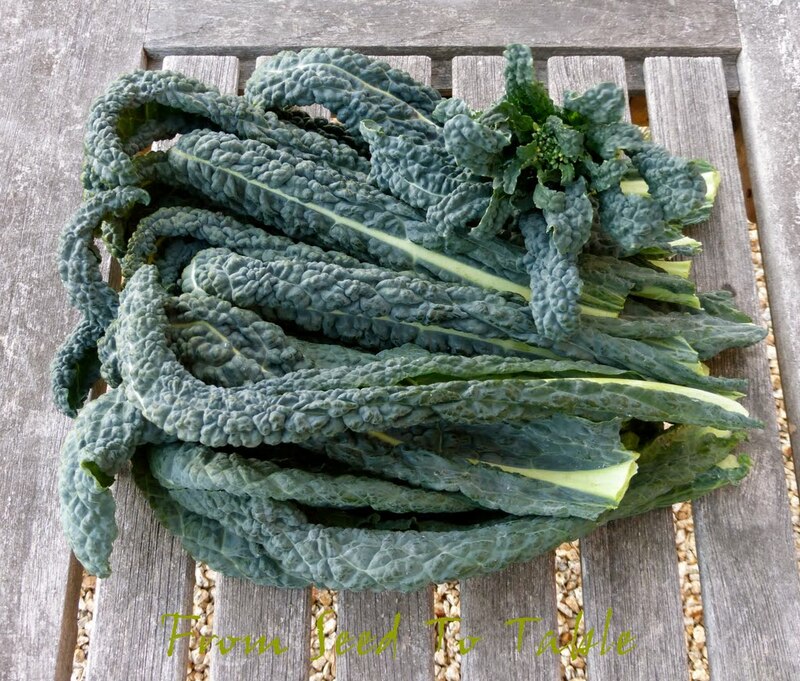 Lacinato kale - 11.5 oz. The total harvests for the past week came to - 3 lb., 12.1 oz. Which pushes the total harvests for 2014 up to - 10 lb., 9.8 oz. This looks like it's going to be a four part series as I look back at 2013 and cover my 2014 plans for each of the four large beds in my garden. Bed #2 was a bit of a mash up last year. 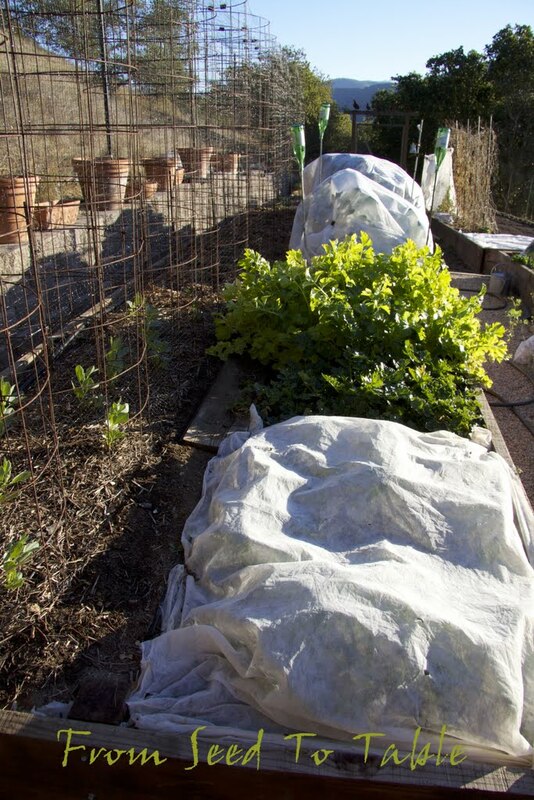 It started the year with half the bed devoted to favas and the other half to overwintering lettuces, brassicas, celery, and overgrown scallions. By June I had cleared out the bed and set out eggplants (Salangana, Sicilian, and Bonica) and a variety of peppers in the front half of the bed. 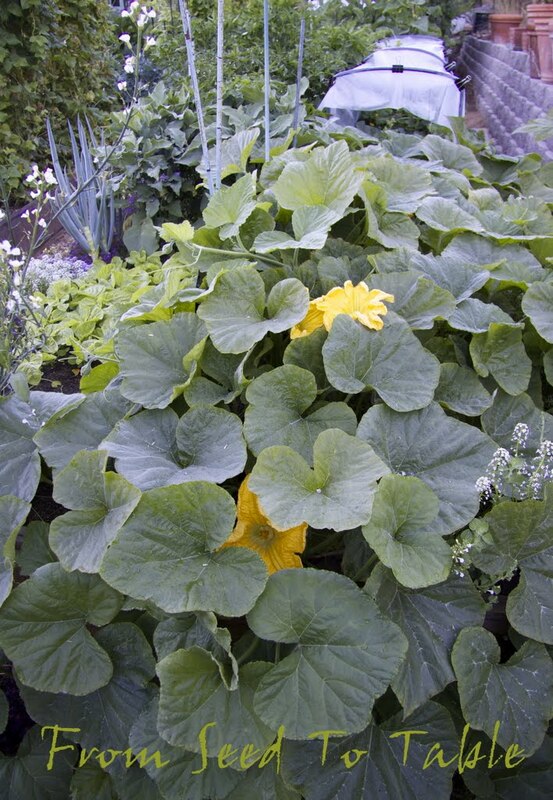 By July I had set out seedlings of Black Futsu squash, Halona and Alvaro melons, and Tasty Green and Garden Oasis cucumbers. The tunnel is protecting the melons, or rather, hopefully keeping them warm so that they would produce some ripe melons. I was keeping one part of the bed open for amaranth which doesn't like the cool weather, specifically the cold nights, that we have through July. By the end of August the bed was absolutely lush. By the end of October everything looked rather tatty but production was still in full swing. Melons had spilled out from under the tunnel and were actually ripening. The tunnel turned out to be a waste of space, this year I'll just let the vines spill out over the sides of the bed and take up space in the path. 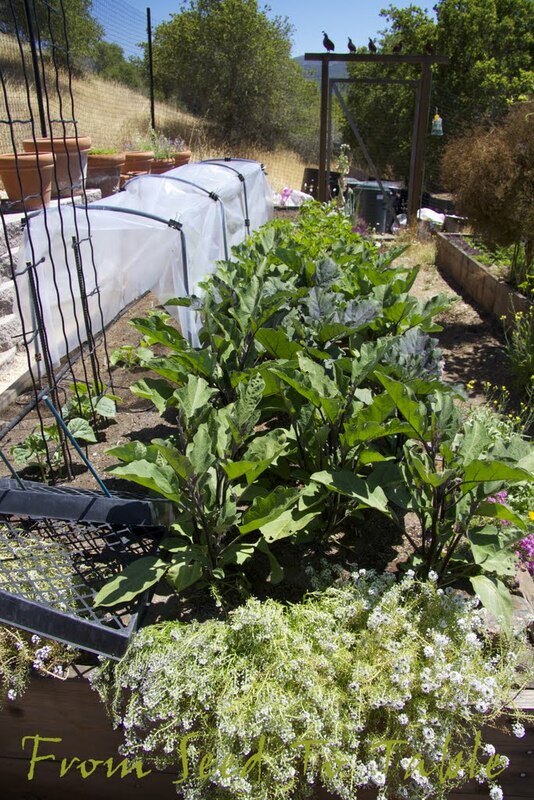 The amaranth had taken off and provided a patch of bright green growth in contrast to the old browning squash leaves. 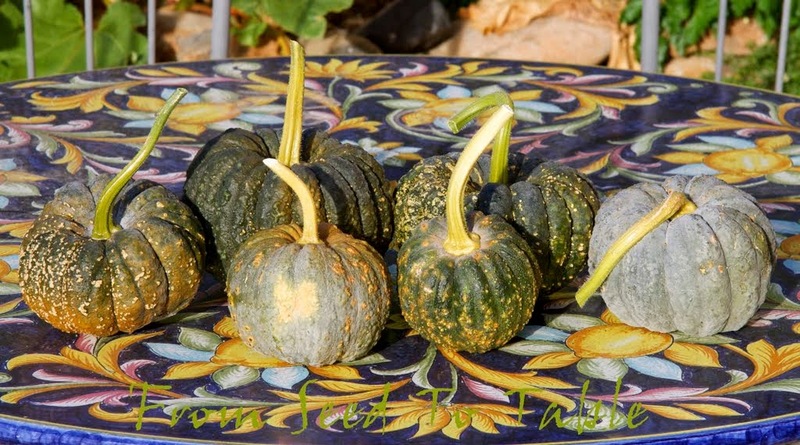 By mid-November the squash and melons were done and I was ready to prepare the space for garlic and shallots. 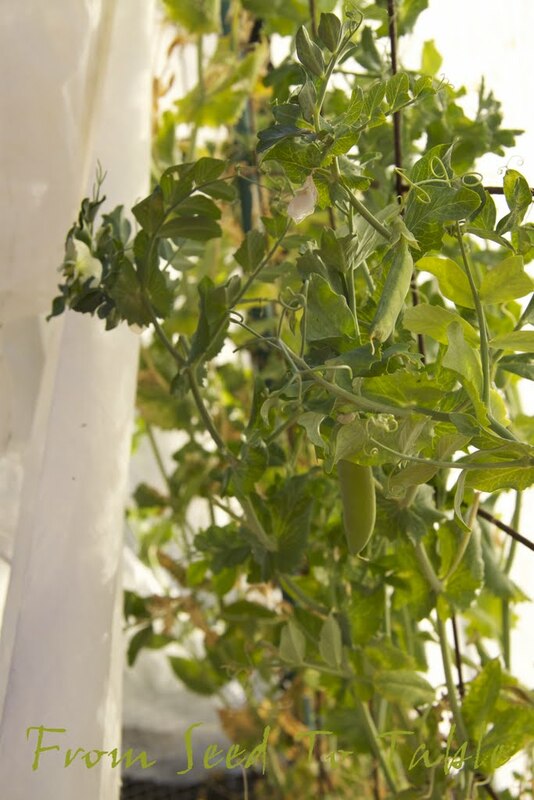 Early December brought some uncommonly freezing nights and an end to the "summer" vegetables that lingered. There were a few lessons that I learned from this bed in 2013. 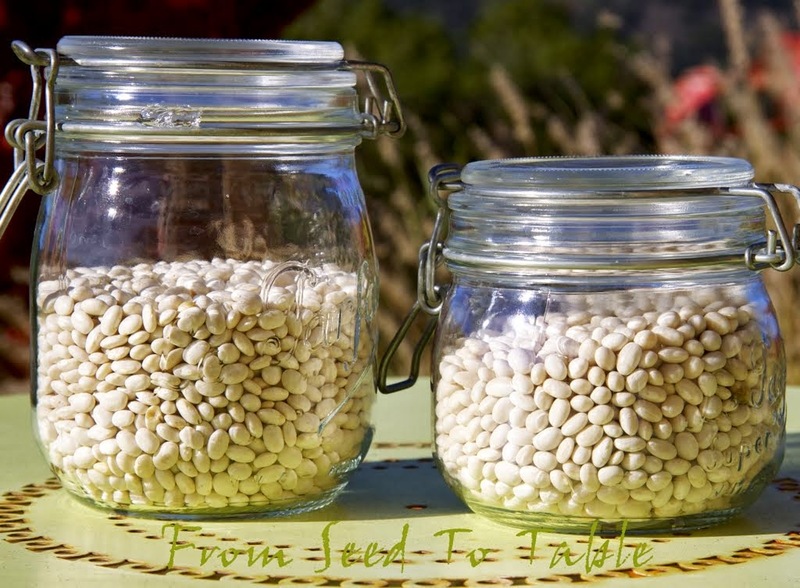 First, that caging favas is the way to go - it keeps them from flopping over when they become weighed down with beans and it makes it easy(ish) to protect the seedlings from the birds (draping bird netting is never a pleasant task). Second, that melons can ripen in my garden if I choose the right variety. Third, that beneficial mycorrhizal and bacterial innoculants work (I've never grown such huge eggplant and pepper plants) and perhaps they gave the curcurbits a good boost as well. That was 2013, now on to 2014. Bed #2 is starting off as primarily alliums. 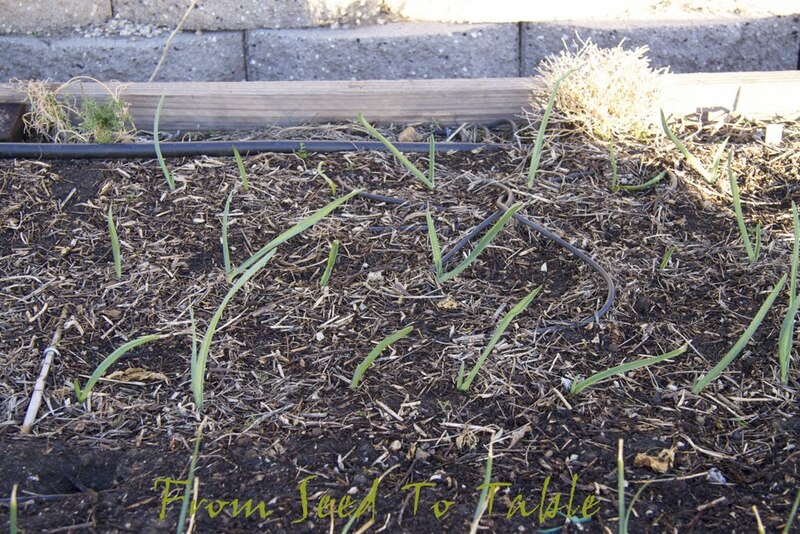 I set out four varieties of garlic on November 19 of last year. Two varieties came from the garlic that I grew last year - Red Jancie and Lorz Italian. The other two varieties are new this year - Inchelium Red and Spanish Roja. I also set out French Gray shallots at the same time. On December 20 I set out three varieties of day-neutral onions - Candy F1, Red Candy Apple F1, and Superstar F1. 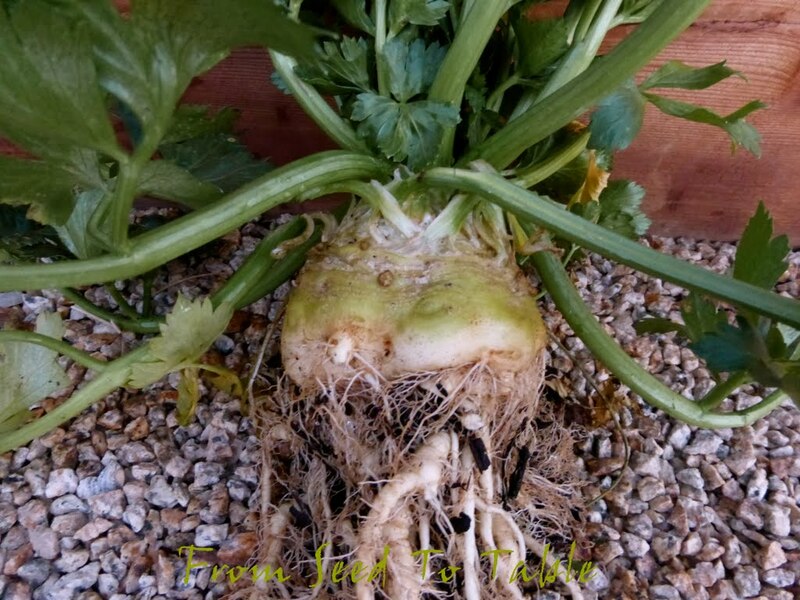 Christina had mentioned her success with growing onions from plants that she had purchased from Dixondale Farms and I made a mental note when I read her post to give them a try this year. Fortunately, I remembered at the optimal time and placed an order. I went the safe route with day-neutral onions. My garden is right on the border of short-day and long-day growing regions. 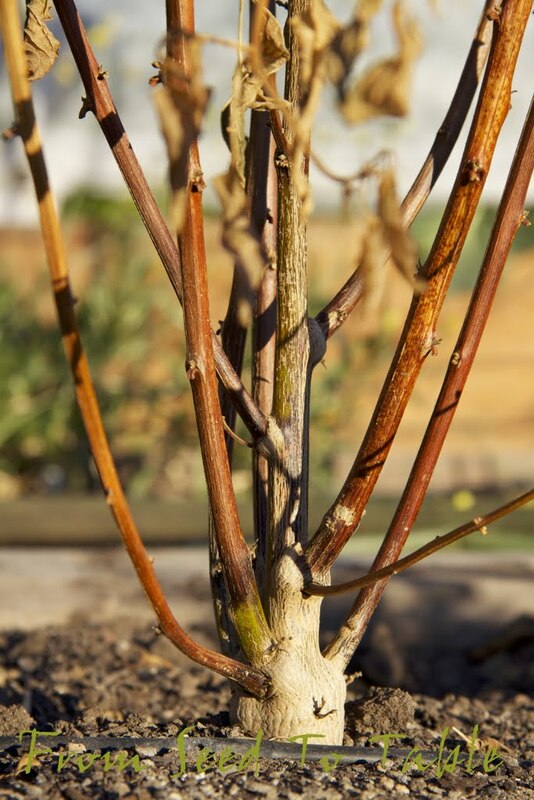 Some varieties of either one might grow properly here but not all will, it's necessary to know just how many hours of daylight are required for a particular variety otherwise it's a gamble. Day-neutral varieties take the guess work or the sleuthing out of the equation, but unfortunately it keeps the selection quite limited. Perhaps I'll do a bit more investigating into other varieties next year. There's two other plantings in the bed right now. The overturned nursery flats are keeping the birds from scratching out the Monticello poppy seedlings (also thanks to Christina). 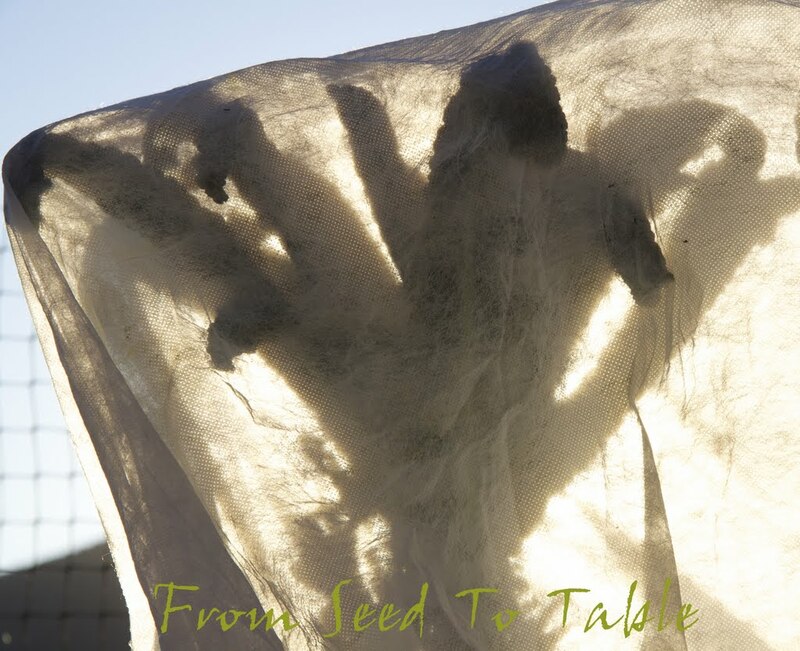 And the bird netting is keeping the birds from eating the new Sonora wheat plants. The record breaking warm and dry weather that we've been experiencing has prompted me to get an early start on my spring plantings. Actually, it has my head swimming with thoughts of summer plantings, but I just can't go there. Not in January. The temperature gauge is saying summer, but I'm still holding out hope for a few good hits of cold wet winter weather while the calendar says it should be so. Although, I have figured out the summer vegetables that I want to grow and I've placed most of my seed orders. The mix of vegetables that I try to grow is constantly evolving as I learn my climate, (um, maybe) and as I figure out the capacity of my garden space (finally fixed), and as I get a grip on just how much I need (as opposed to want) to grow of various vegetables. Now that all four of my new raised beds are complete I can try to figure out a rotation that will allow me to maximize the space and minimize the waste through the year. 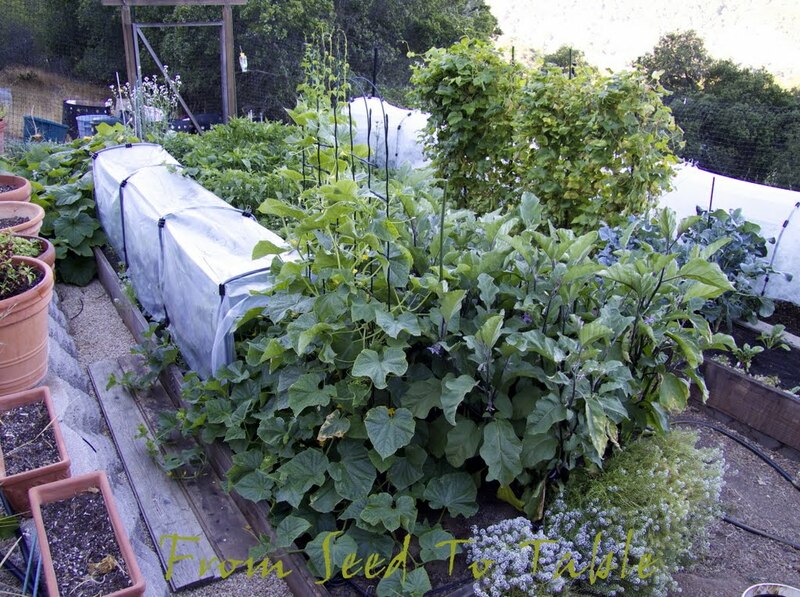 In my January 14 garden tour post I mentioned the preliminary plans that I have for each bed. The plans so far are for what types of vegetables will go into which bed but I've not figured out where specific varieties will go and that sort of detailed planning is not likely to happen. 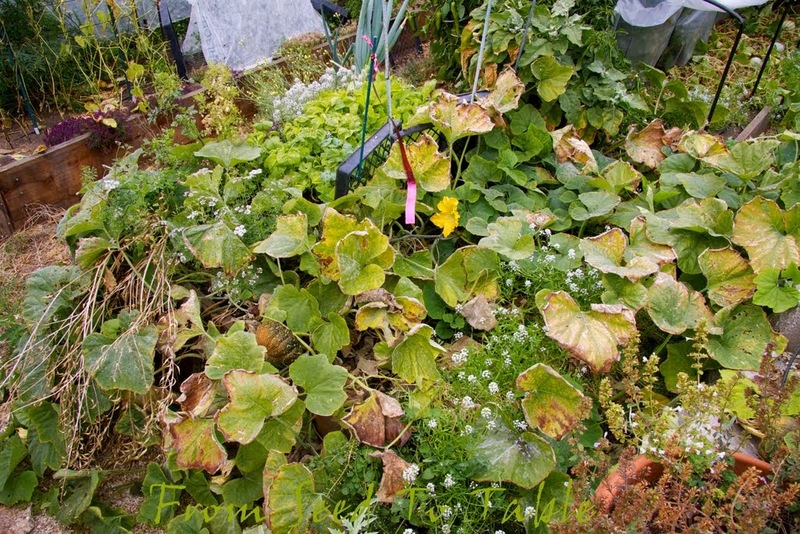 I find it best to have a general sort of plan and plant out specific varieties as time, space, and the vagaries of germination and harvests permit. So let's take a look at what each bed produced last year and what I hope to grow in the coming year. In this post I will discuss Bed #1. Last year - This bed was finally up and running in June of last year, it was where I grew my tomatoes but no other solanums. One corner was planted with beets in June and July and those grew like crazy and got huge but the quality remained excellent. Those gave way some time in September or October (my record keeping got fuzzy around then) to the Romanesco that is there now. The rest of the bed was planted out to fall/winter vegetables (carrots, celeriac, celery, napa cabbage, and broccoli) in August and September. The tomatoes were replaced with fava beans in two successions, first in November when I tore out the Andine Cornue paste tomatoes and the Martian Giant tomatoes. Then again in December when I took out the rest of the tomatoes after a few nights of freezing temperatures finished them off. The succession from tomatoes to favas worked well last year and seems to be working well this year so I hope to keep that succession going in future years. 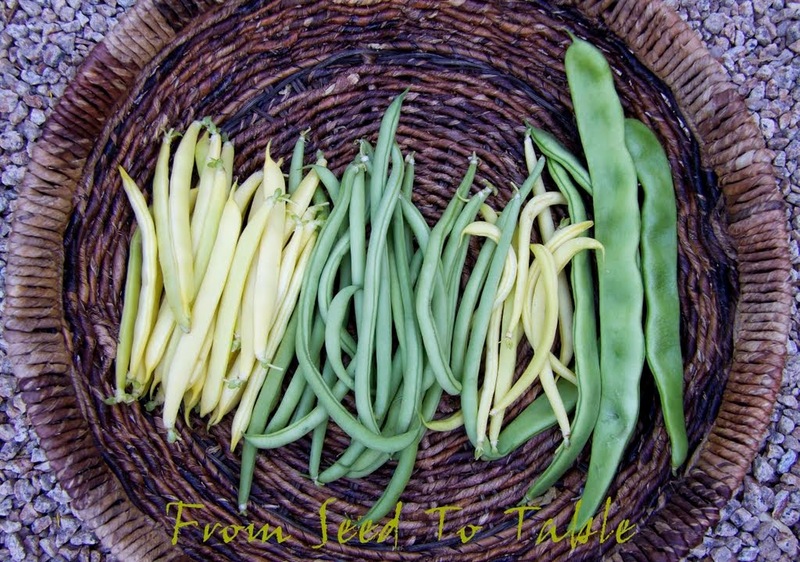 The fava harvests start in April and finish in May which will be just in time to transition to pole beans, corn, and cucumbers. I found last year that trying to get beans and cucumbers going any earlier doesn't work well - lesson learned. 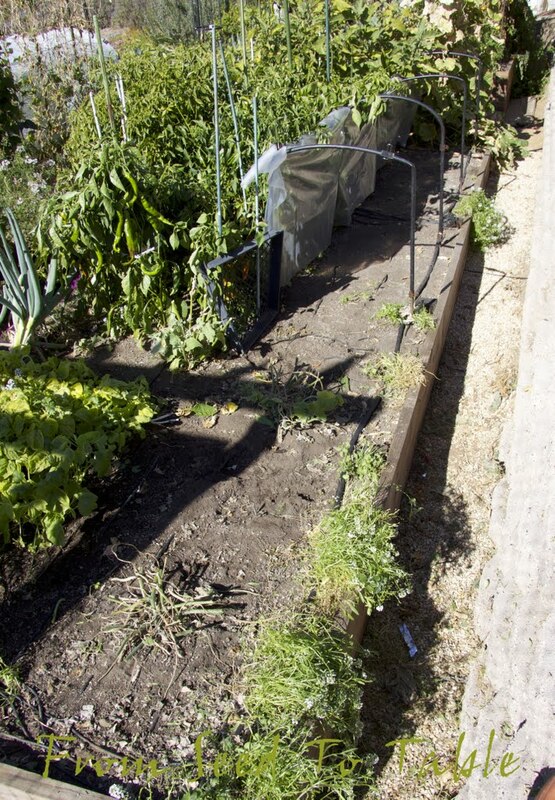 The garden beds run basically north to south so I can grow tall vegetables the length of the row where the favas are now (the back side) and shorter vegetables along the side where the fall/winter vegetables are producing now (the front side). The plan for this year includes my first ever "Three Sisters" planting. I'm growing corn for the first time since I can't remember when, not in this garden (7 years), not in my last garden (4 years), maybe in the garden before that. I've not bothered to grow corn before because it is rather a space hog and I've not had enough space to devote to it until now. I've also been quite content with the sweet corn that I can get at the farmer's market. Actually, I'm still quite content with the sweet corn that I can get at the farmer's market. I plan on trying to grow flint corn this year so that I can grind my own fresh homegrown polenta and cornmeal. 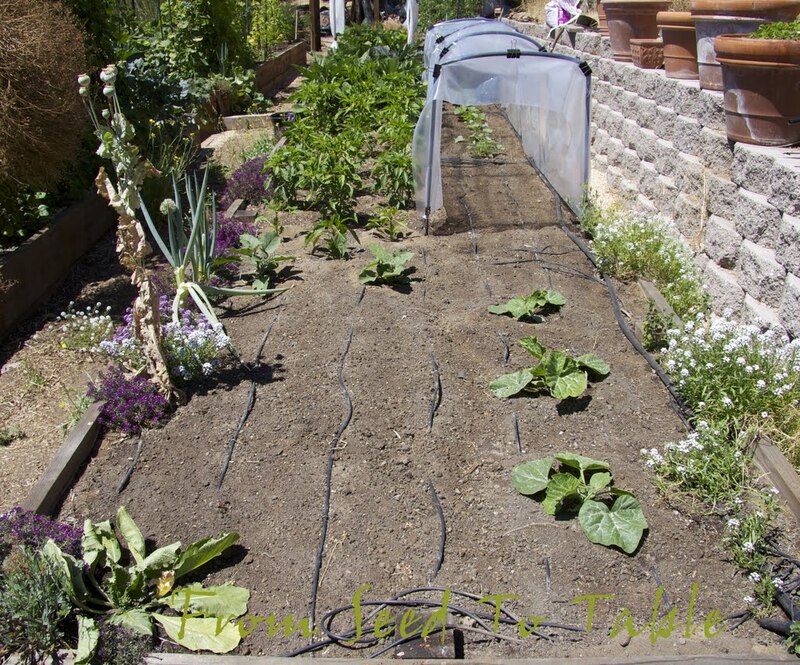 My plan is to plant the back side of the bed with blocks of corn, alternating with trellises of pole beans, and one small trellis of cucumbers. 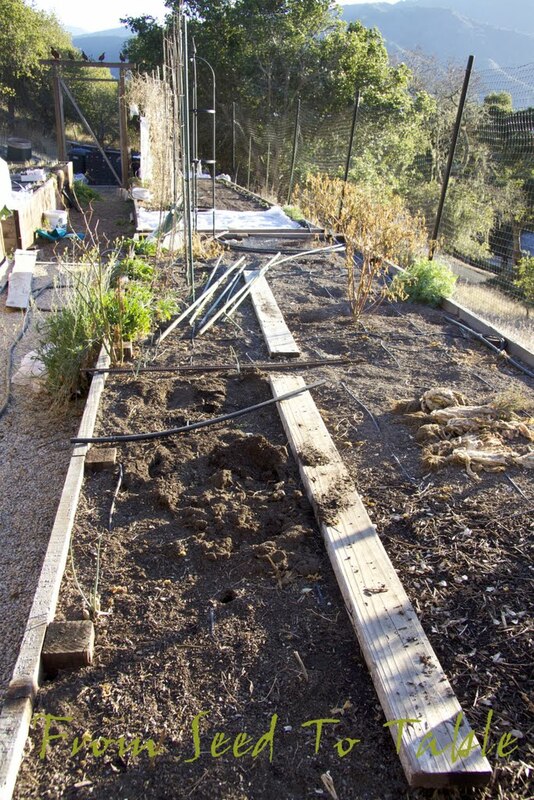 The front side of the bed will be planted with zucchini, winter squash, maybe melons, and bush beans. Corn: Red Floriani and Cascade Ruby Gold, both flint corns. Polenta and cornmeal are only an occasional treat around here so I really don't need to grow a lot of corn. I figure that 12 to 15 plants of each variety should be enough to meet my needs so 4 small blocks, two blocks of each variety should fit into the bed nicely. Three trellises of beans should fit nicely between the blocks of corn. 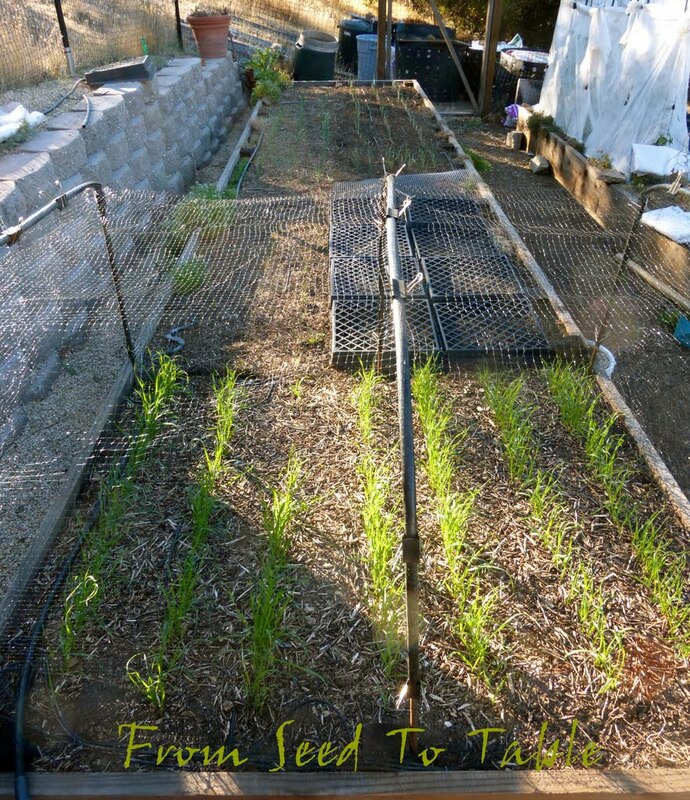 I want to devote two trellises to green beans, each trellis will be planted with at least two varieties of beans, but maybe I'll try three or four per trellis this year. My aim is to have a nice steady supply of a variety of beans through the season, so I'll try to restrain myself and succession sow the trellises over the season. If the weather cooperates I may be able to get three plantings, first one trellis, then the second, then back to the first one. 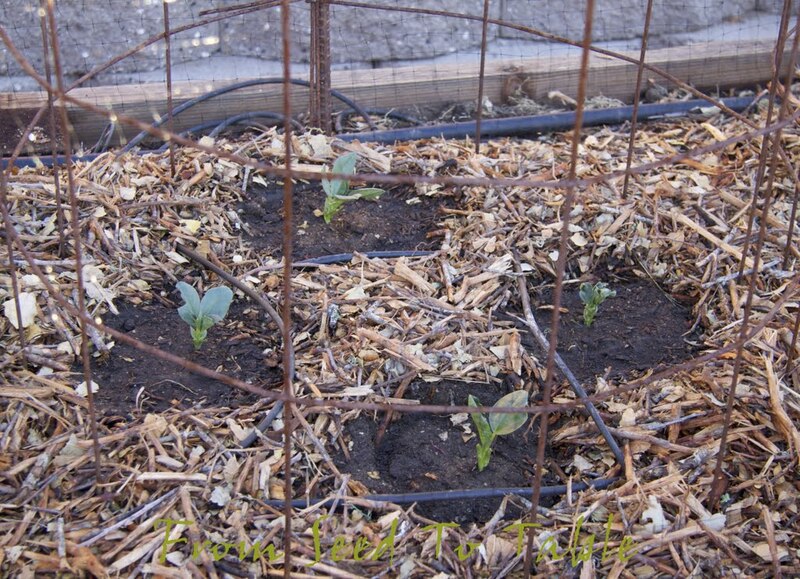 Hmm, perhaps I'll be able to transition the second trellis of beans to snap or snow peas in the fall. It will be hard to see any empty trellis sitting there, but I really don't want to have to deal with a big glut of beans all at once. The third trellis will be devoted to a planting of dry beans that will have to sit there through the whole season, although I might be able to transition that trellis to snap or snow peas also. Black Futu squash produced really well for me last year. I love the smaller size of the squash and both my husband and I find it to be really delicious. I'll devote one corner of the bed to a few more vines of that. It was really easy to direct the vines to where I wanted them to grow last year so I'll be trying the same tactic again this year, let them grow over the edge of the bed and then around the sides. Remember QuadraZuke, aka F1 Romanesco zucchini? I'm going to plant another of the same variety this year. But QuadraZuke did not produce any male blossoms after it popped the first half dozen or so when it was a youngster. My husband loves stuffed zucchini blossoms and the male blossoms are best suited for that. 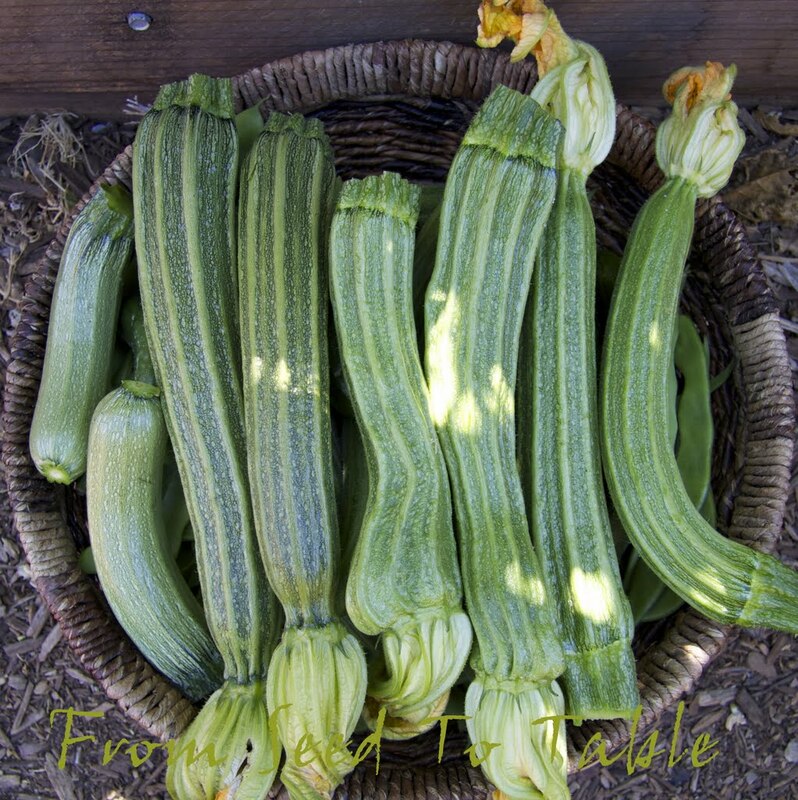 So this year I got seeds for San Pasquale zucchini which is described as producing a nice amount of male blossoms - I'll grow one of those this year and we'll see. I grew two varieties of melon last year, Alvaro and Halona. Halona was a big bust but Alvaro was productive and really tasty. I'll try to save some space for a couple more Alvaro vines this year. 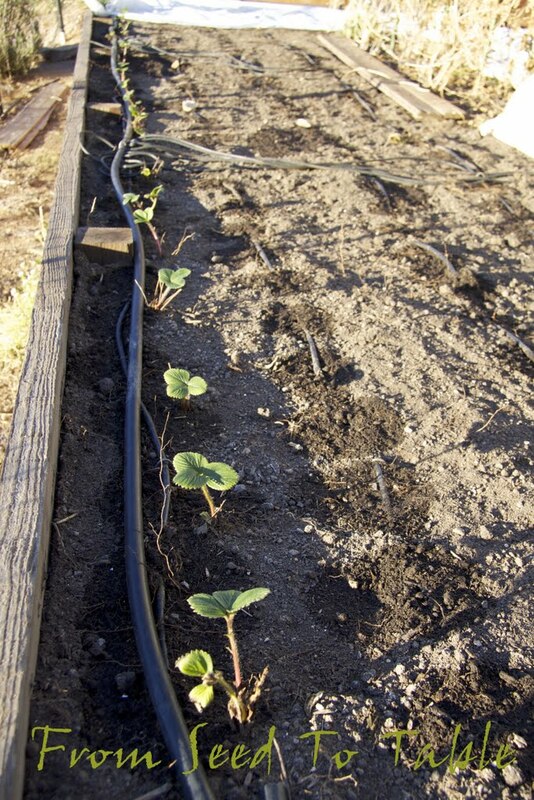 I think I'll try the same method that I use for the vining winter squash and let the vines grow down over the edge of the bed. 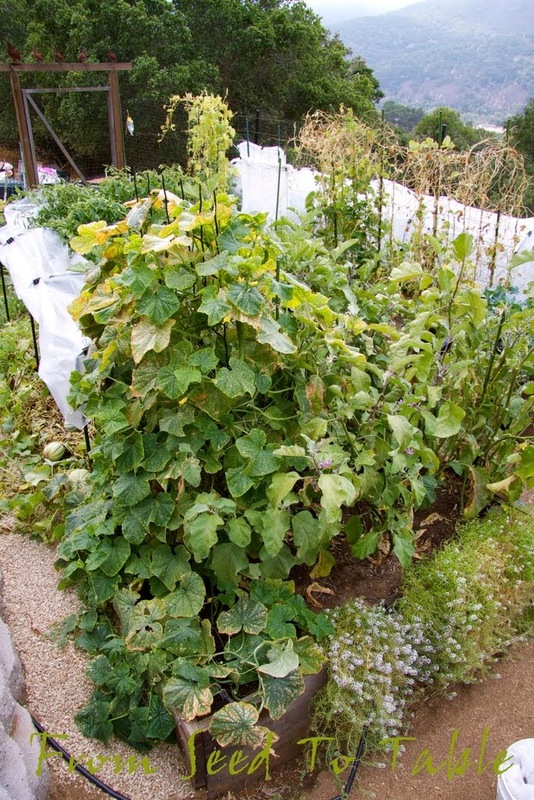 This will not only save some space in the bed, but if I let the vines grow down onto the gravel path they will get to soak up more heat than they would if they were sprawling around the bed and that should help to ripen the melons properly. 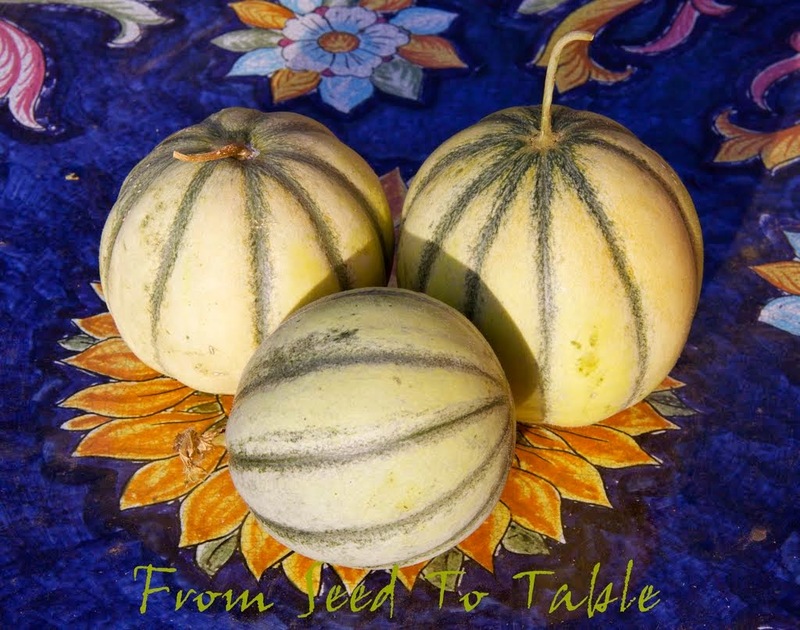 The biggest problem I have with growing melons is that I have to plant them rather late because of the peculiarities of my growing season - cool summer but warm fall. I'm not sure that I will have a spot open for these babies when planting time comes. 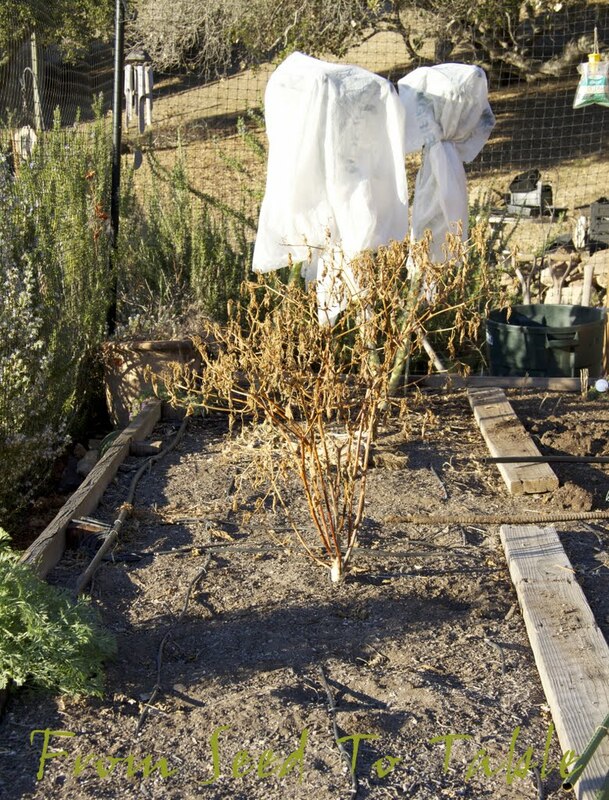 Any space that is left in the bed will be devoted to growing bush dry beans. 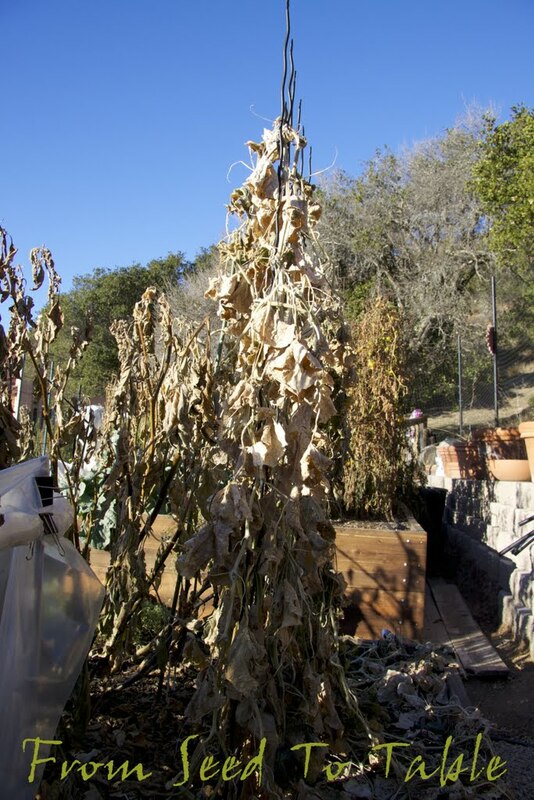 I tried to grow out a new stock of Purgatory beans last year but I started them too soon and the plants suffered. This year I will try again and wait until the proper time to plant. I also want to grow a black bean this year so I've got seeds for Black Coco beans ordered and then I also couldn't resist the temptation to buy Rosso di Lucca beans also. Melons? What melons? That's the plan for Bed # 1 for 2014. I've not yet wrapped my head around what the rotation will be into 2015, perhaps it will be the allium bed. Ah well, I'll deal with that later. Not much new to report this week other than a handful of snap peas which were a nice sweet treat. 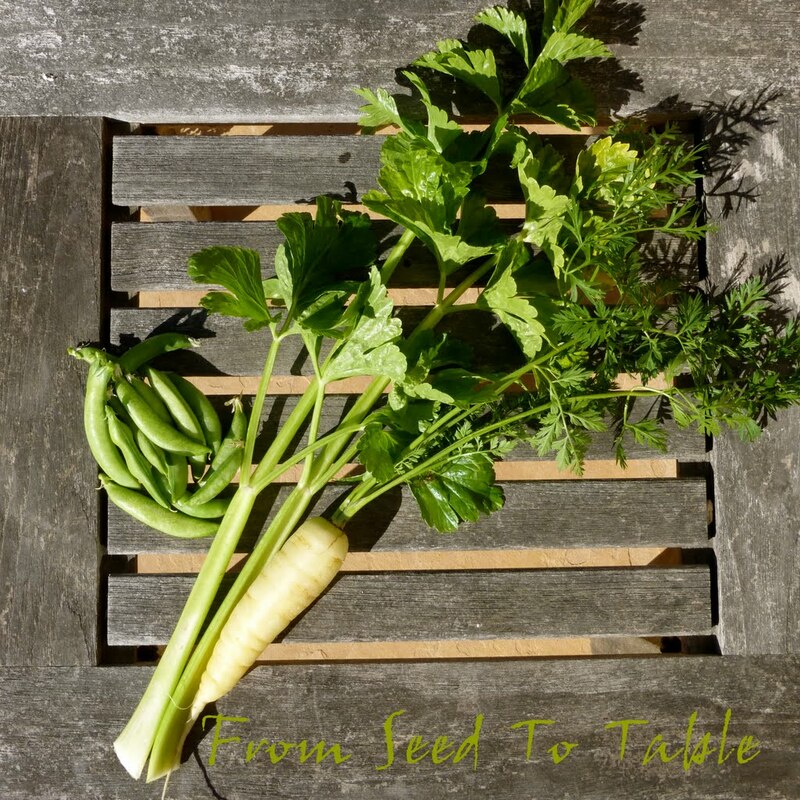 I harvested a few stalks of celery a few days for my lunch salads (made with store bought greens, alas) and I found a few nice carrots to add to the salads. 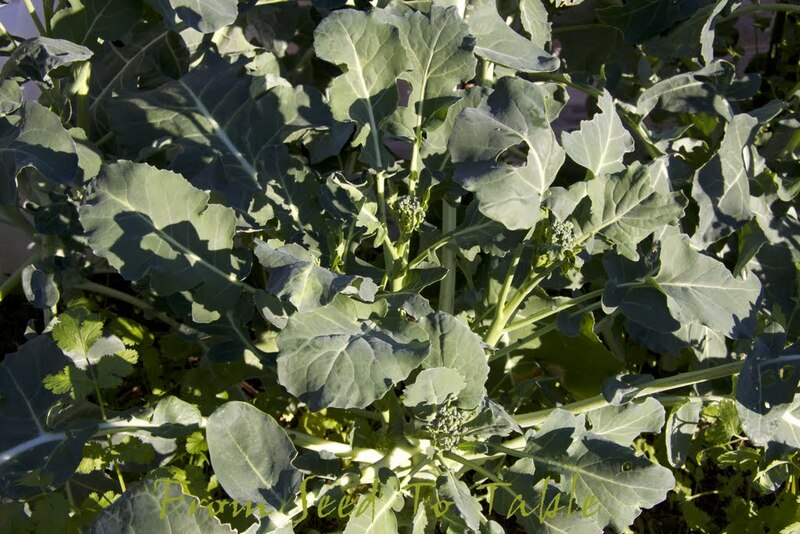 The Di Ciccio broccoli continues to pump out shoots. These were harvested yesterday and haven't been consumed yet. I had a similar bunch from last week which was used in two preparations - the largest leaves were used in a frittata and the shoots were steamed and served with a garlic sauce that I've been making lately. I use a whole head of garlic, peel the cloves and cut the largest ones in half, put the cloves in a small copper butter warmer, add a few tablespoons of good white wine, a pinch of salt, and cover with a generous pour of olive oil and simmer for about an hour (or even just 30 minutes) until the cloves are soft. Carefully mash the garlic to a paste with a fork (or you can remove them from the pan and mash or chop them, then add them back to the pan), melt a tablespoon or two of butter into the mixture, season with some pepper and serve warm. The sauce is great scooped up with artichoke leaves, or drizzled on steamed Romanesco broccoli, or cauliflower, or broccoli shoots. You can add some chopped capers to the sauce, or pepper flakes, or dried oregano, or fresh rosemary. It's really addictive and a great way to use up an abundance of garlic. Well, it's official now, we are in a serious drought. I am certainly enjoying the warm sunny days, but it's a guilty pleasure. These kinds of temperatures make me want to sow some tomatoes, and eggplants, and peppers... But I'll hold off until the usual time in hopes of inclement weather to come. On the other hand, it may be time to invest in a few new buckets. I remember the last time we had a serious drought, we had a bucket in every shower to collect the water to use to flush the toilet or to haul outside to water a few precious plants. I think those days are about to return. Di Ciccio broccoli - 1 lb., 10.4 oz. Circus Circus carrots - 3.5 oz. Sugarsnax carrots - 3.9 oz. Dorato D'Asti celery - 15.1 oz. Sugar Daddy snap peas - 2.5 oz. The harvest totals for the past week were - 3 lb., 3.4 oz. 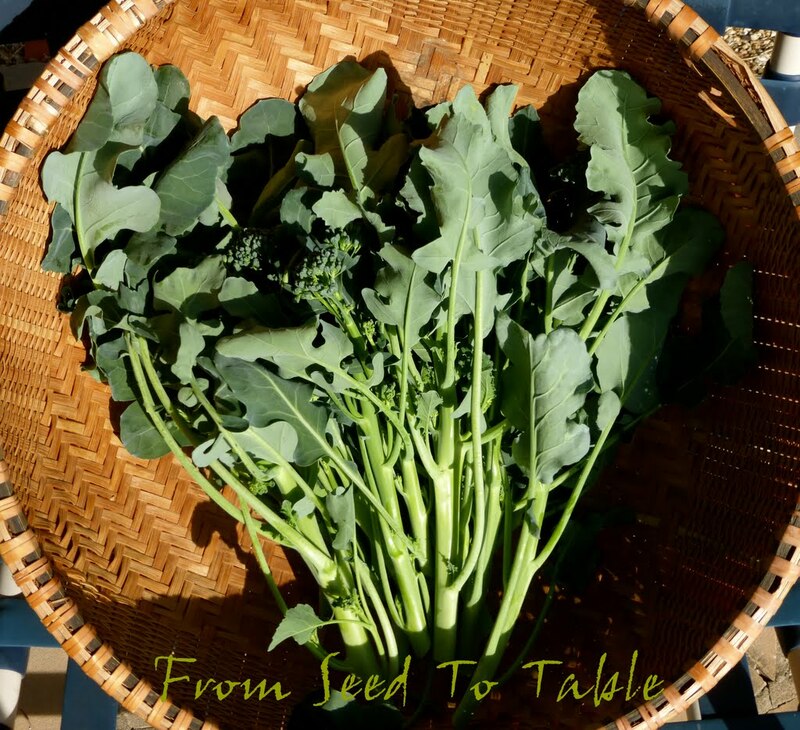 Which brings the total harvests for 2014 up to 6 lb., 13.7 oz. It has been taking me a few days to pull this post together, there's just too many distractions at the moment.The garden is looking a bit ghostly and like it's been abandoned lately, but I've actually been doing quite a bit of work when I can spare the time. 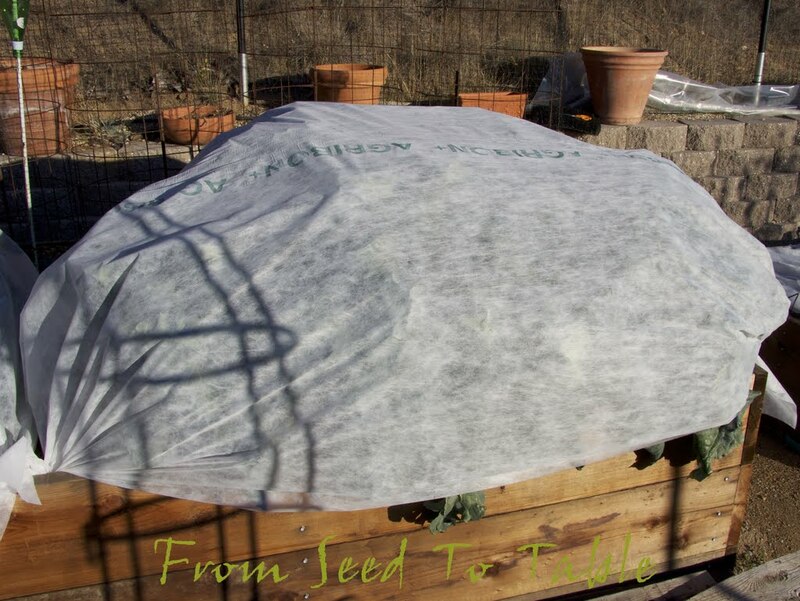 Much of Bed #1 is shrouded with Agribon, not for protection from the cold, but to keep the birds from pecking things into lacy oblivion. In the foreground is the carrot patch that has been the source of the recent carrot harvests. Just beyond the carrots are the celeriac and celery. Here they are - Monarch celeriac on the left, just getting to be large enough to harvest, and Dorato D'Asti celery on the right. I've been harvesting the celery on a cut-and-come-again basis. There's a glimpse of what is left of the napa cabbage on the right, under it's shroud of Agribon. The cabbage needs to be cleaned out and then I'm going to slip in a few more carrots in there. The next shroud is protecting the Di Ciccio broccoli. Ta Da! 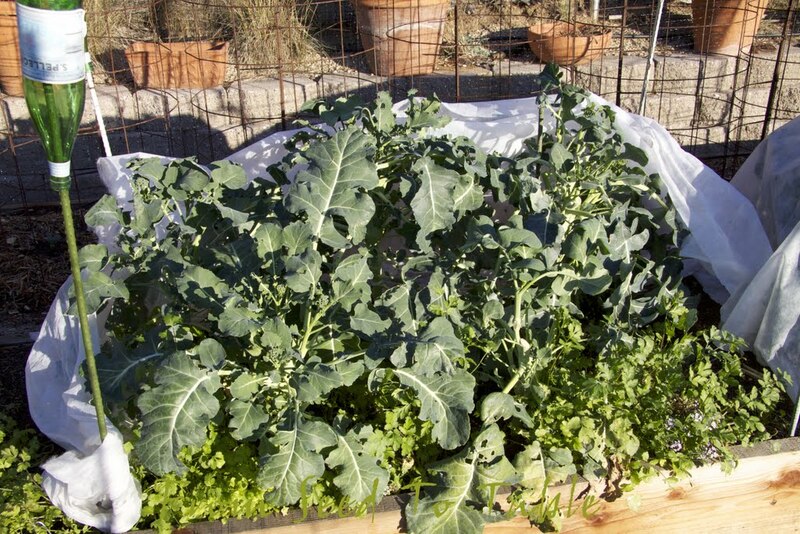 Some pretty healthy looking broccoli plants with an accompanying patch of cilantro (coriander). The cilantro in the rest of the garden has been cleaned out by the birds. There's some nice shoots developing in there and so far the aphids haven't been too much of a problem. 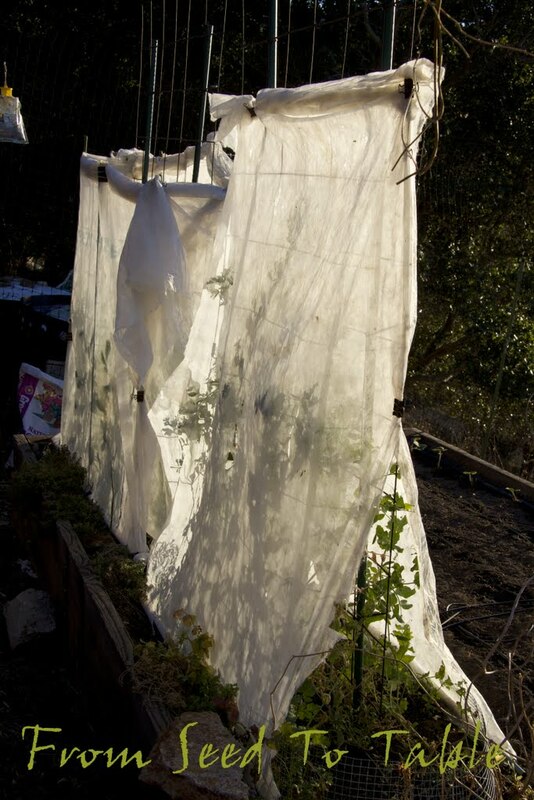 This shroud is hiding the Romanesco broccoli from the birds. The damage from the freezing nights back in December was minimal and the plants have been growing nicely. However, the aphids have taken up residence in the developing heads so I need to take care of that. The back side of the bed is where the tomatoes grew last year. I've figured out a rotation that worked well last year and I'm trying again this year. 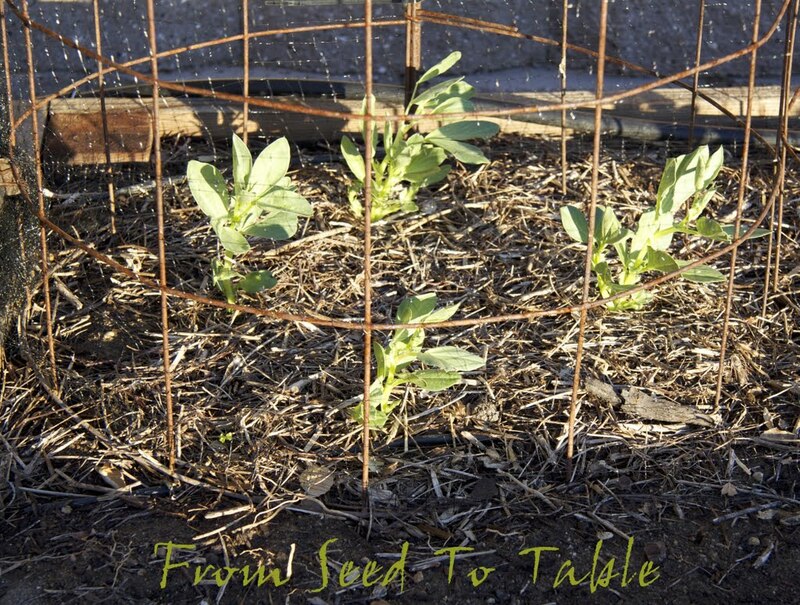 When the tomatoes are done I pull them out and plant favas (broad beans) and then replace the cages. The cages prevent the mature fava plants from flopping over when they become heavy with beans. 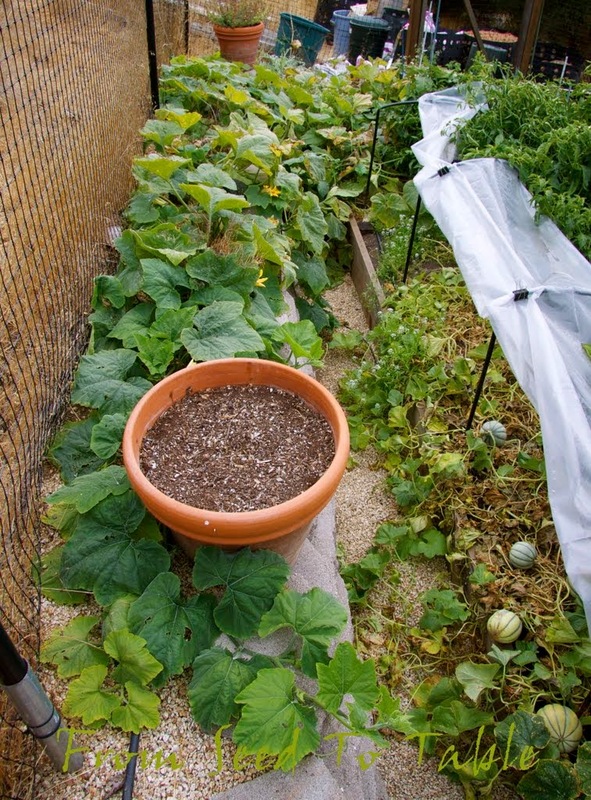 The cages also provide a handy scaffold for draping bird netting over the young plants to protect them from the birds. I cleaned out the tomatoes in two stages, the first plants came out in late November or early December and I planted the beans right away (although I didn't record the date). These plants are from the first sowing. Here's the plants from the December 14th (second) sowing. The plan for bed # 1 is to transition to corn, beans, and curcurbits starting around the end of April and into May and June. Bed #2 isn't looking like much at the moment, but it's full of potential. 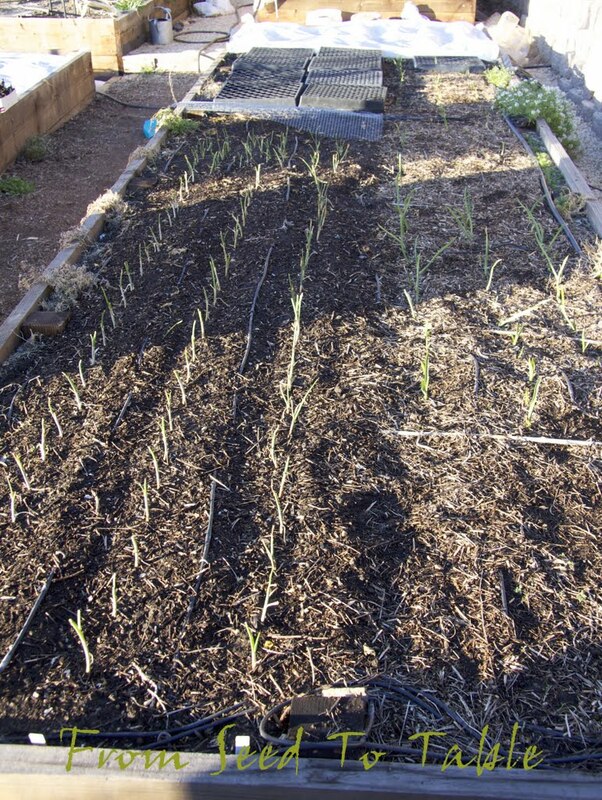 The lower left, extending about half the length of the bed (about 10 feet) is planted with three varieties of day neutral onions - Candy, Red Candy Apple, and Supersweet. I went the easy route and purchased plants instead of starting from seed. 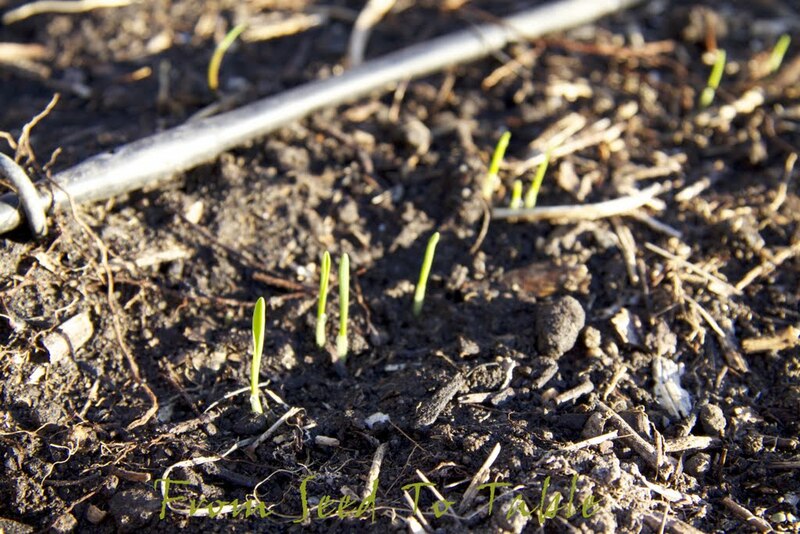 To the right of the onions are the emerging garlic shoots. This year I've planted out cloves from a couple of the best heads of the garlic I grew last year - Lorz Italian and Red Janice. And I also purchased a couple of new varieties - Inchelium Red and Spanish Roja. Inchelium Red is the speedster, it was the first to emerge and is growing quickly. Next fastest is Red Janice. Red Janice is the variety that I'm using up first in the kitchen, it's developing shoots much more quickly than Lorz Italian. The Lorz Italian is the slowest to emerge, it's in that seemingly empty patch in the lower right in the photo above. This year I'm trying shallots for the first time, these are the new shoots of French Gray shallots. More Agribon bird protection for another new experiment in the garden. 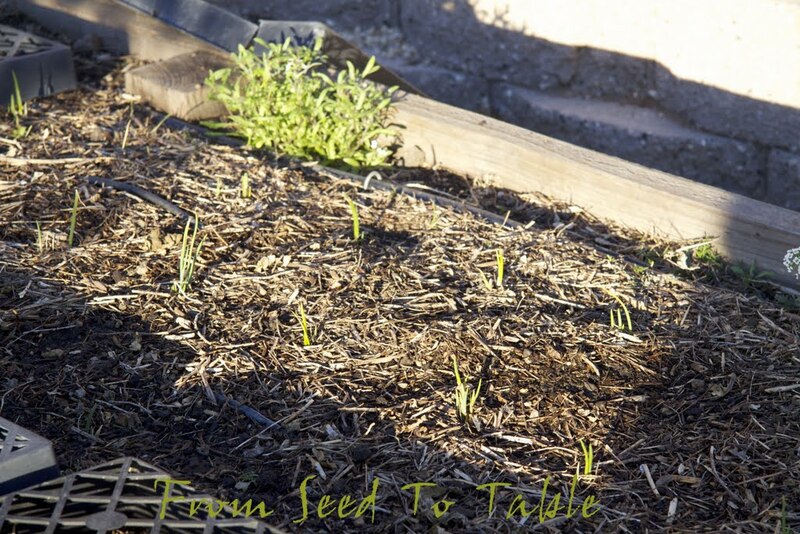 The far end of the allium bed is planted with an heirloom variety of wheat that used to be widely grown in California. 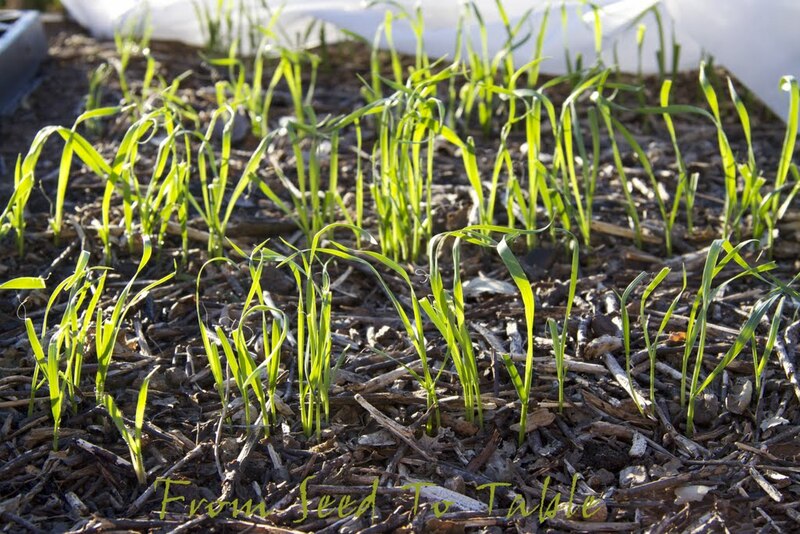 These are the emerging shoots of Sonora Wheat, a soft white wheat that makes great whole wheat pastry and is also supposed to make excellent tortillas. I've also read about a pizzeria that is making great pizza dough with Sonora wheat - another kitchen experiment to indulge in one of these days. 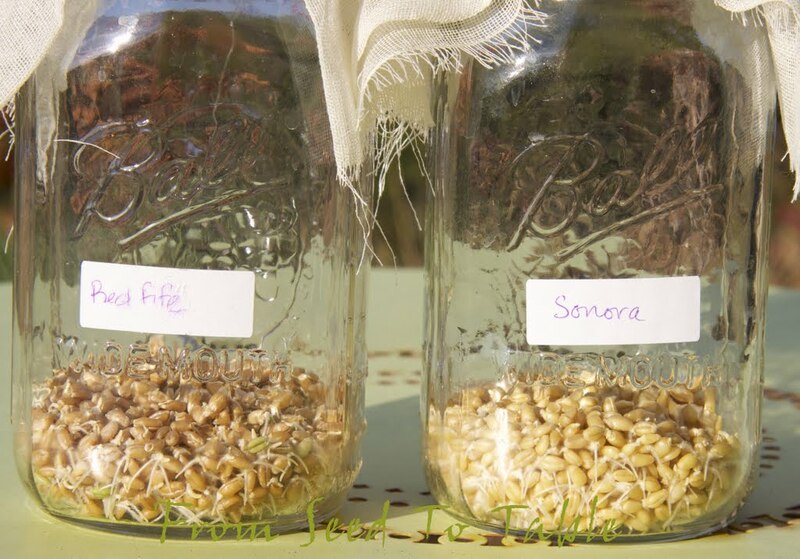 My wheat "seeds" came from a quantity of Sonora wheat berries that I had purchased after I invested in a grain mill for grinding my own flour for my occasional indulgence in home made bread or pastry. When I learned that this variety of wheat had been grown for a long time in California the gardener in me made the mental leap to "wheat berries = wheat seeds". After a successful sprout test I immediately set to work to get a patch going. In mid summer my plan is to transition bed #2 to more beans, perhaps snap/snow peas, and fall/winter brassicas, celery, celeriac. That's two varieties of wheat passing the sprout test, and across the path from the Sonora wheat you can see another swath of Agribon which is protecting a newly emerging patch of Red Fife wheat. Red Fife is an heirloom hard red wheat that makes fantastic bread. By the way, the sprouted wheat berries were excellent raw in salads. There's the wheat patch in the foreground of bed #3. 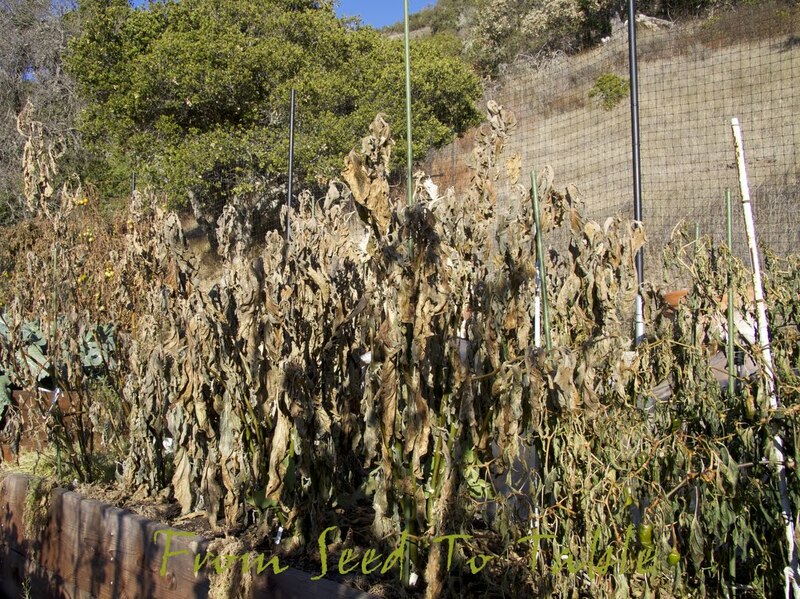 The old Gigante bean plants are on the left. I haven't decided if I'm going to try to transplant those plants or just start anew for this year. 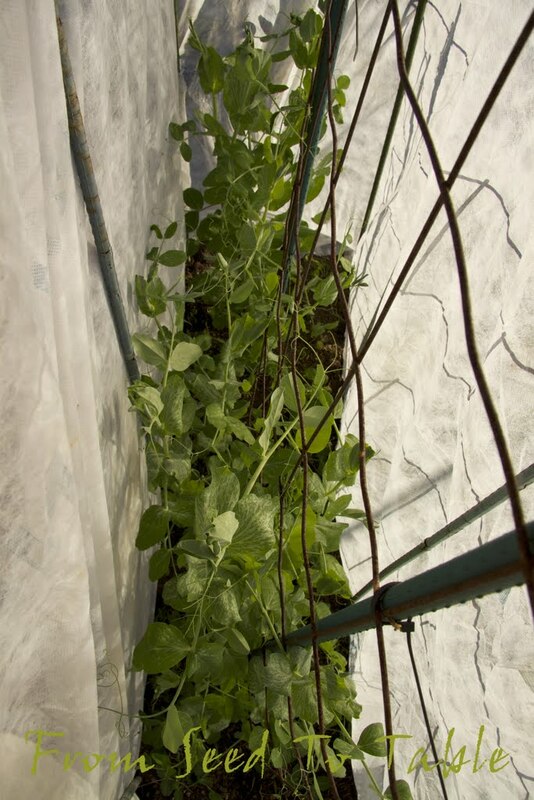 Beyond the Gigante beans are a couple of shrouded trellises supporting snap and snow peas. My record keeping fell apart this fall so I don't remember exactly when these were planted, but the snap peas were well along and starting to produce before we experienced freezing nights in early December and the snow peas had been recently planted out just before the freeze. 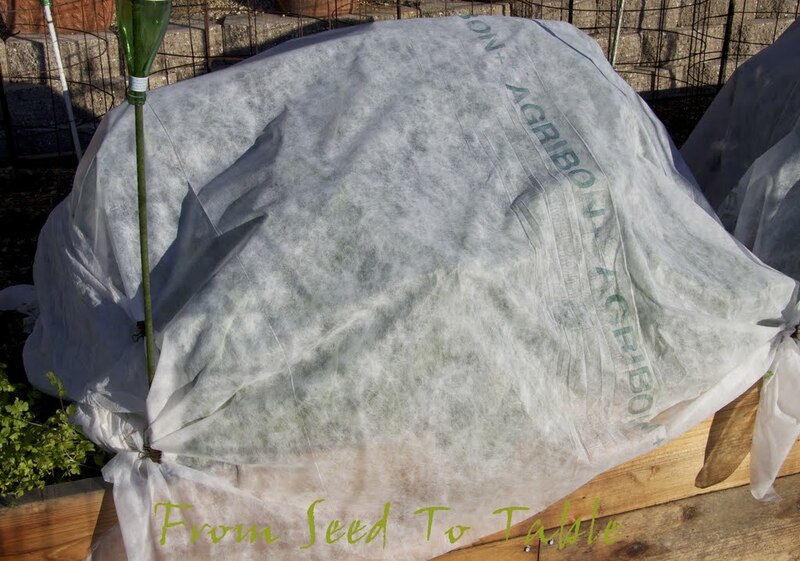 I added an extra layer of heavy Agribon frost cloth before the freeze so the plants survived for the most part. The frost cloth is gone now but the row cover remains (need I say why?). The snap peas are in the foreground. Some of the plants have recovered enough to produce a handful of tasty pods and there's a few more pods on the way. 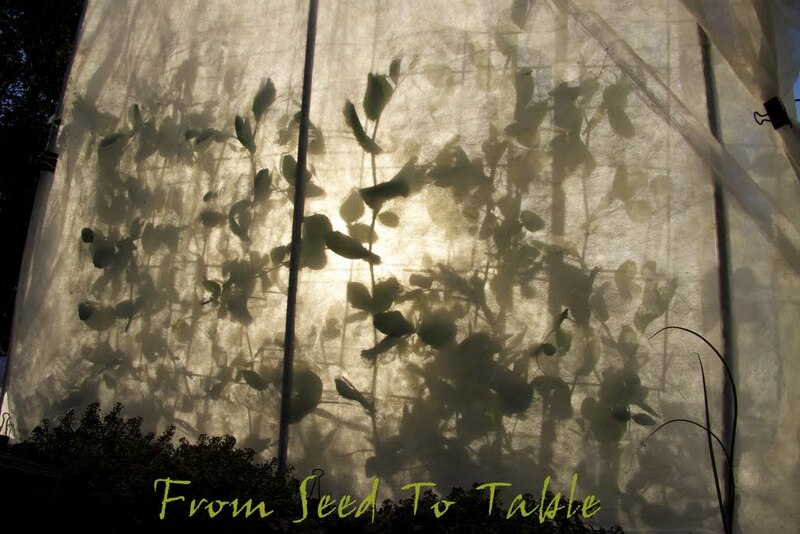 The snow pea seedlings sailed through the freezing nights and have recently started to climb their trellis. Oh they look happy! I spied the very first flower buds developing just the other day. 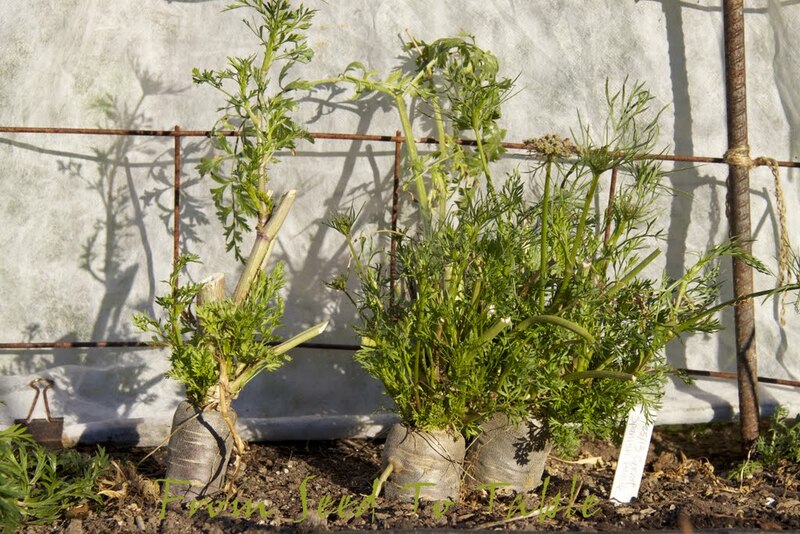 Along the backside of the snow pea enclosure are some extremely mature Spanish Black carrots. I sowed the seeds for these carrots nearly a year ago. They were in full bloom when the freezing nights struck in December. All the flowers died. But the roots survived so I cut all the top growth off and there's new growth. Perhaps I'll get some seeds after all! 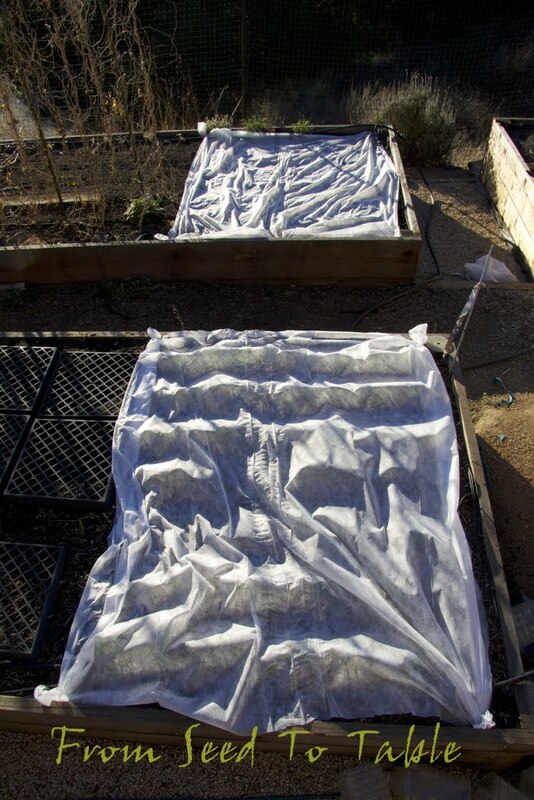 The rest of the bed was the pepper patch which was wiped out by the freeze. I finished cleaning out the pepper patch last week and prepared the bed for new plantings, one of which is a row of Seascape strawberries along the edge of the bed. I've got some spinach, beets, chard, and pea shoots starting in paper pots which will be planted out soon. 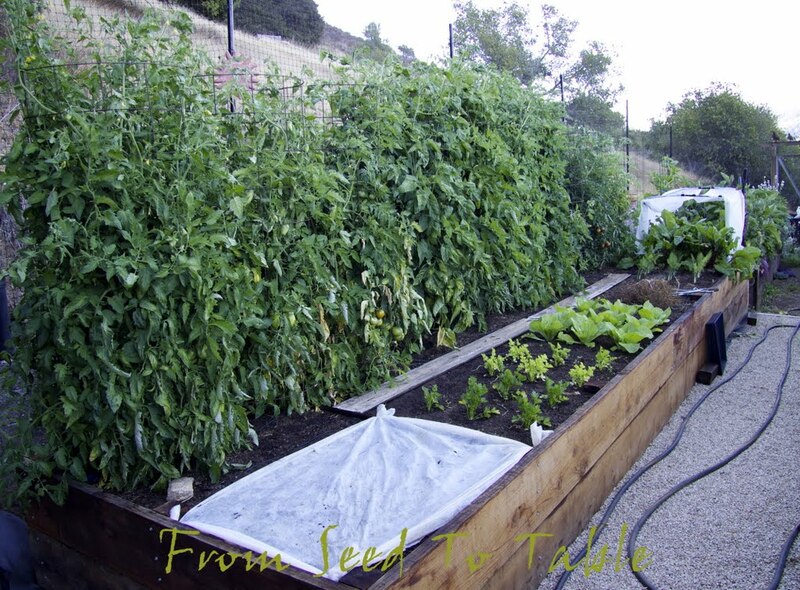 My plan for bed #3 through the year is to grow a variety of greens and roots there. I've ordered seeds for a few new Asian greens. I'm going to be sowing some corn salad seeds soon, as well as lettuces, and other salad greens. 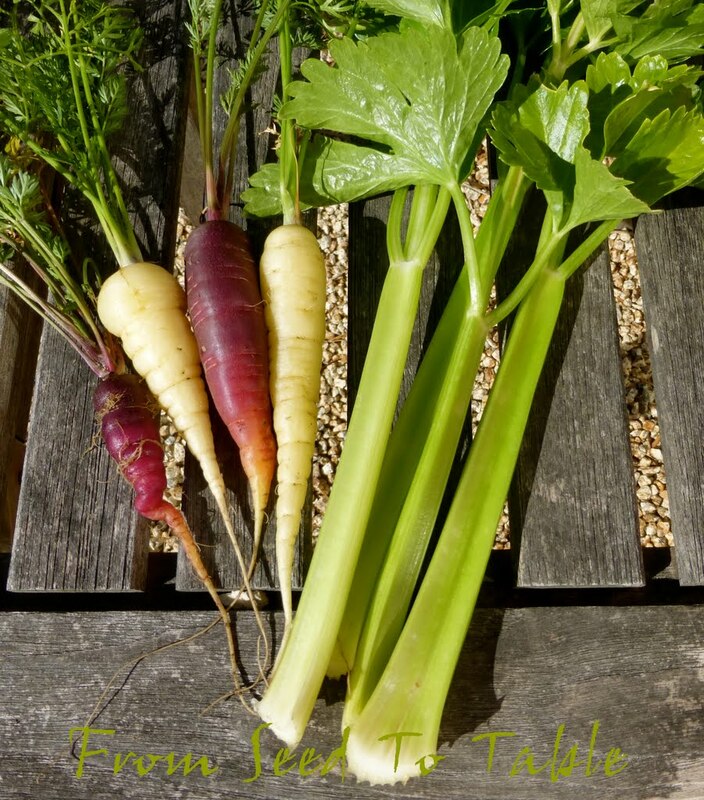 Later in the year I'll sow carrot and parsnip seeds. 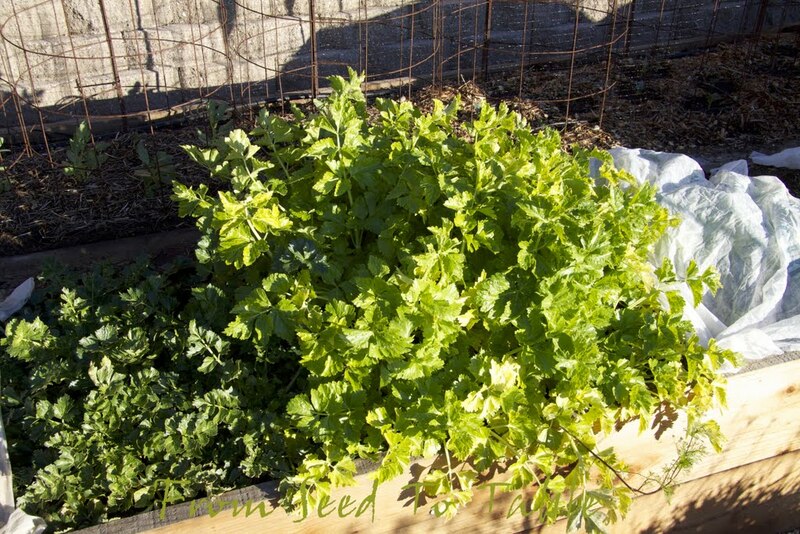 I hope to be able to keep a succession of greens and salad goodies going through the year. Bed #4 is the most desolate looking. I'm still in the process of cleaning it out. Some of Stefani's runner beans still had nice fleshy roots when I dug them out so I've been potting them up and hope that they will survive long enough to be planted out into bed #1 after the favas are done. There is one veggie in this bed that is still producing. 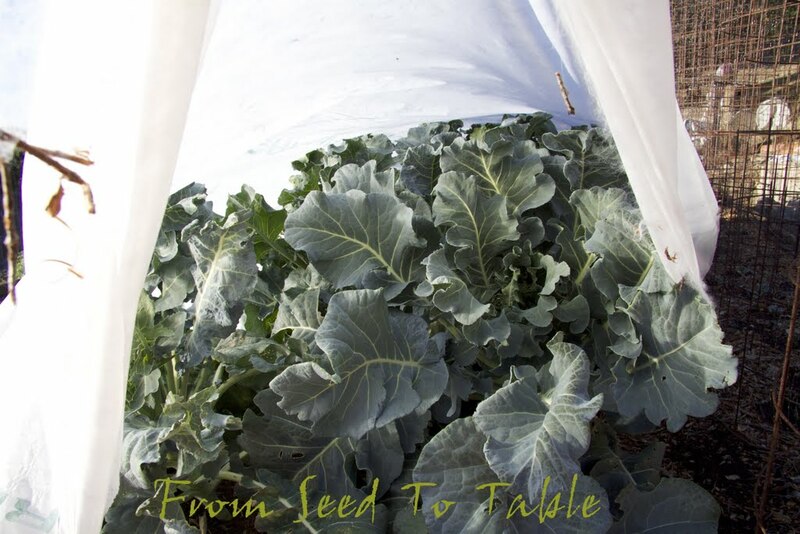 Lacinato kale, hiding from the birds under the Agribon. I'm so happy that I invested in a 250' roll of Agribon a few years ago. I just got to the end of the roll last week when I had to cover up the wheat. I think it may be time to order up again. There's one more plant in this bed that I'm keeping an eye on, the frost smacked volunteer Aji Angelo pepper plant. The crown of the plant looks like it's still alive and I've had C. baccatum plants regrow that looked worse than this. I'm going to leave it in place for now. 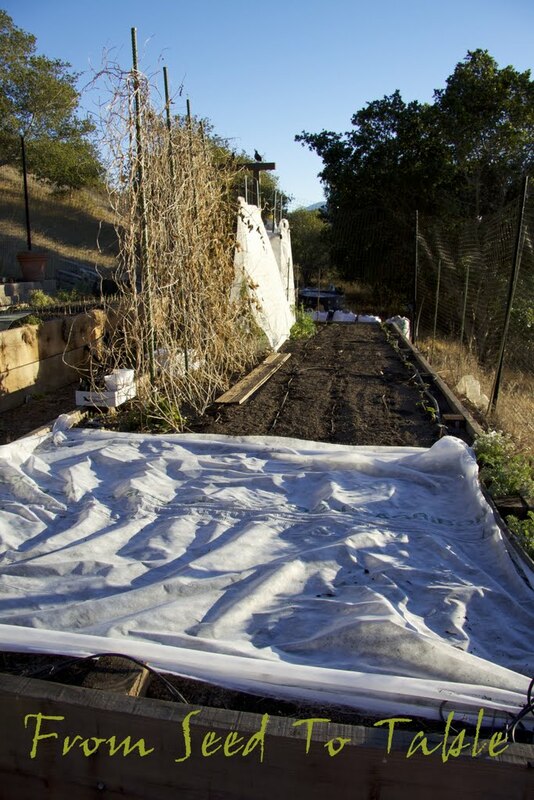 Bed #4 is going to be the solanum bed for 2014. I'm going to really control myself and limit the number of peppers that I'm going to grow to this bed and they will have to share space with the tomatoes and eggplant (fewer eggplant this year too). I have learned that it doesn't pay too plant my solanums too early, the beginning of May is early enough and the end of May isn't too late. This year I've decided to plant a cover crop in this bed. If I get the cover crop sown at the beginning of February it should be ready to dig in by the end of March which will leave at least a month for it to decompose. 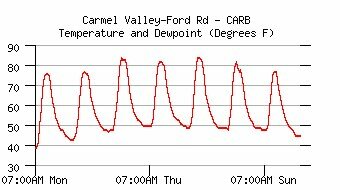 Almost 80ºF (26.5ºC) on a January afternoon. 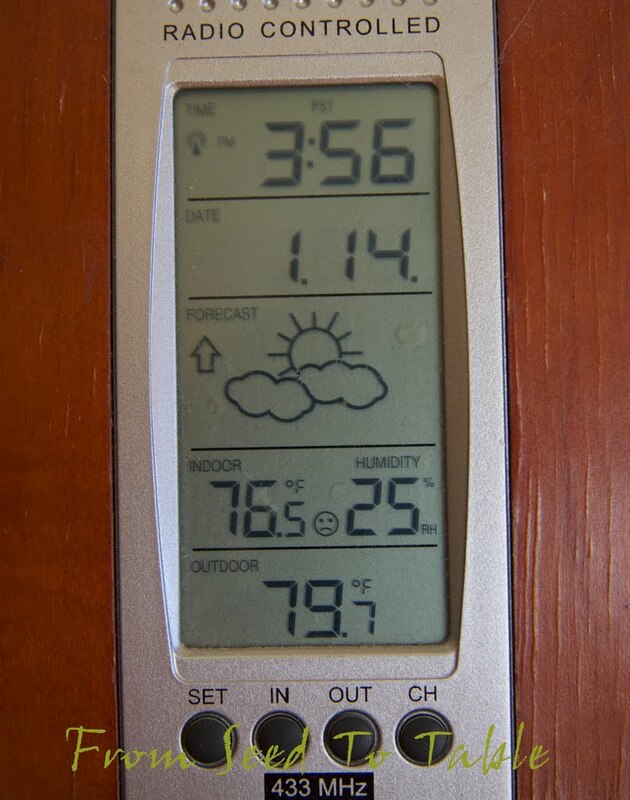 Yesterday it got up to 87ºF (30.5ºC) and today is forecast to be about the same. I'm taking a guilty pleasure in the warm weather. We've had about 2 inches (5cm) of rain in the past year, the driest year since record keeping started here back in 1850. There's no rain in sight through the end of the month, at least. It's frightening. The warm weather is nice, but I wish it was cold and rainy right now. To end on a happier note, at least the super resilient rosemary is blooming. The bees are buzzing about the flowers and the little birds are munching on the seeds and I have something pretty to look at. 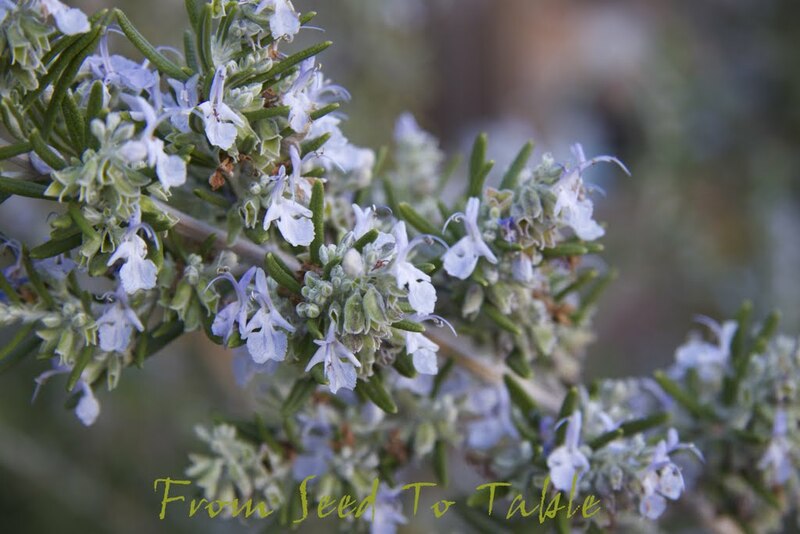 Stay tuned, my seed orders have been placed and I'm working on a post to evaluate what I grew last year and what I've got planned for the coming year. But first I've got to get out to the garden and finish cleaning up bed #4.